Boys aren’t reading as much or as well as girls. “[B]oys have fallen behind in reading in every single state,” Nicholas D. Kristof wrote for The New York Times in 2010, citing a report from the Center on Education Policy. Another motivational tool is to use reading logs, Kristen Bevilacqua, a literacy volunteer in South Africa, suggests. The log’s purpose is as a “milestone tracker” more than a diary, which might be considered “girly.” The log is a place for boys to record the number of genres or chapter books they have read. “Since reading is an activity that is often too abstract for many boys, the concrete proof of their success will be beneficial to their reading confidence and independence,” according to Bevilacqua. And definitely enlist the help of male role models. The guide “Me Read? No Way!” highlights a mentor program at St. Thomas University in New Brunswick, Canada, where men in their 20s developed “informal educational relationships” with male students, who they met weekly for two years. “Male-teacher librarians need to read books—lots of books. Always have a book on hand. Carry it. Know a wide selection of books that boys will read,” Joel Shoemaker is quoted as saying in the guide, published by the Ontario Ministry of Education. Even younger boys can model good reading habits for their peers. Bevilacqua suggests creating book recommendation boards in school, where boys write a summary of the book of the month or week and explain why they liked it. 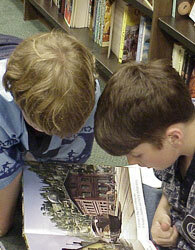 “A book recommended by a friend, needs no other stamp of approval for boys to want to read it too,” Bevilacqua wrote. Ontario Ministry of Education: Me Read? No Way! This article was originally written by Shannon Firth; it was updated on June 23, 2017.